In the distant future, Homo Sapiens have slowly colonized its solar system and over the course of centuries has evolved and adapted, diverging into five new races, suited to life in different planetary environments. Will you lead your people out of darkness and into the bright future of a new galactic empire? Who will be able to create the greatest star-spanning civilization? 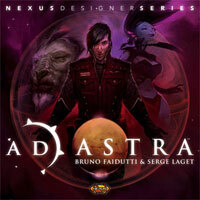 Ad Astra is a game designed by Bruno Faidutti and Serge Laget, the team behind Mystery of the Abbey (© 2003 Days of Wonder). Three to five players will take on the roles of one of five human subspecies and explore the galaxy in search of new planets to mine for resources or settle on and terraform into habitable worlds. Also hidden in the furthest reaches of unexplored space are the relics of dead alien civilizations - technology which provides massive powers - the reward for those brave humans who dare the depths of the galaxy. These are of a very good quality and the artwork is superb. The shame is that the colours could have been more distinctive on the cards and score tokens. The other let down is the movement cards which use icons to represent the various Suns which are replicated on the Sun tokens. The problem is that you end up looking at the Picture of the sun not the small icon on the edge which causes a little confusion in the game. The idea is to explore various planets settling on some to generate resources to build or upgrade your assets. Then, and this involves careful planning, you need to start playing your scoring cards (which only get returned to your hand after you play all 3). You are unlikely to score high on all 3 so the trick is to minimise your loses on 1 or 2 of the cards and try to maximise on the 3rd so you can try and get a couple of good rounds scoring with it. The various planets produce either one of 3 different ores, energy, food or Water. Amongst these planets are Alien worlds that hide artifacts that give a variety of bonuses or special abilities usable during the game. The Alien worlds do not produce goods but you can score bonus points for building colonies and upgrading these to factories. Each player colour has a different pairing of resources on each production card which means you need to plan carefully what resources planets you build on. Each player also has a different pair of systems on each movement card and has all but 2 of the systems represented on the 3 cards. This means that for the other systems you will be reliant on other players movement cards. The rules are not that complicated and can be explained quite quickly, but there is depth here and further plays of the game will reveal different strategies to win with the ability to play with a different colour set adding to the games longevity. When either the last planet is explored or someone gets 50 or more points the current round is completed, then simply the person with the most points Wins. This game plays extremely well and generally remains quite close until the last few rounds. The theme is well suited, the various mechanics work well together leaving a lot replayability. I would recommend this game, with the caveat that it will take at least one game to get to grips with how all the elements tie together so that your second game you will be much better placed to use subtle strategies needed to play it well. I’ve played Ad Astra 3 times now as its a favorite amongst some of the locals. I love space games, I love great art and a good looking atmosphere so during the unboxing, I was getting really excited. During the rules explanation, I was still pretty excited. When the game ended, I felt robbed. Somehow, given the combination of rules, the components and the length of the game, I felt like more should have happened. But nothing was really accomplished. I moved a ship or two, I placed down a few plastic pieces, but I could not get even a smidgeon of appreciation that I had done anything other play a few cards of little relevance. What I typically expect from a game like this is a feeling that I’ve accomplished something, that I’ve built up a small little empire, or that I’ve overcome a challenge from another race, etc..
****, I get this feeling from Race for the Galaxy, 7 Wonders, and 51st state. Ad Astra does a really good job of providing you a feeling of how big and empty space is and how insignificant your actions feel in the grand scheme of things. Probably because the game covers a lot of tablespace, but there isn’t a whole lot on the table. This is actually a very cool illusory affect for a good tone, but it also sets me up at least for that empty feeling at the end of the game for having done little. Normally, I relish games that pit one player against another player in terms of decision making. Ad Astra offers this with the role selection and order, but it still feels all too random. Why do I care if you say build at the #3 spot or move at #4 spot? I’m not saying that a games design needs to mesh intimately with the theme, but this role selection feels too disjointed from the theme and creates a level of randomness to the game’s outcome that leaves you with little control over your strategy. Your strategy for this 4x lite game really is to guess correctly. I think this would be a fine game if it had a little extra depth or played more quickly. Ad Astra is a resource managing game in which every player has to explore the galaxy to find new planets, obtain resources from them, and building different types of buildings, that will have different effects such as gaining victory points, more resources, and so on. Quite similar to Settlers of Catan in its premises, I prefer this one because the (excessive) luck factor in Catan is almost completely removed: every action and resource production from planets is planned by all players in precise order, so everyone will exactly know when and what his planets will produce. Very nice components, games are shorter than Catan (about 1 hr), and nice theme with great art. Add a Review for "Ad Astra"